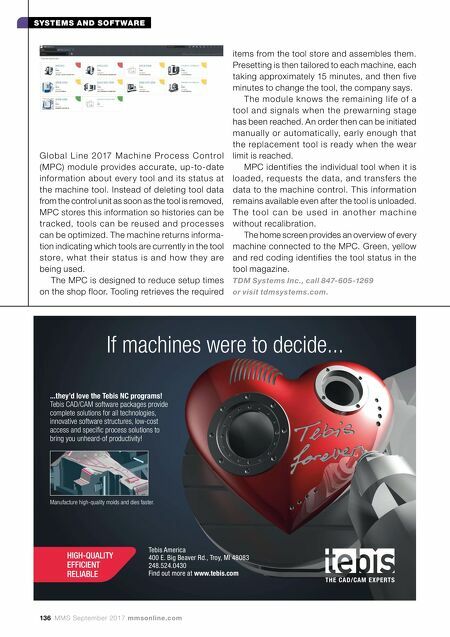 136 MMS September 2017 mmsonline.com SYSTEMS AND SOFTWARE If machines were to decide... ...they'd love the Tebis NC programs! Tebis CAD/CAM software packages provide complete solutions for all technologies, innovative software structures, low-cost access and specifi c process solutions to bring you unheard-of productivity! HIGH-QUALITY EFFICIENT RELIABLE Manufacture high-quality molds and dies faster. Tebis America 400 E. Big Beaver Rd., Troy, MI 48083 248.524.0430 Find out more at www.tebis.com G l o b a l L i n e 2017 M a c h i n e Pro c e s s C o ntro l (MPC) module provides accurate, up-to-date information about ever y tool and its status at the machine tool. Instead of deleting tool data from the control unit as soon as the tool is removed, MPC stores this information so histories can be tracked, tools can be reused and processes can be optimized. The machine returns informa- tion indicating which tools are currently in the tool store, what the ir status is a nd how they are being used. The MPC is designed to reduce setup times on the shop floor. Tooling retrieves the required items from the tool store and assembles them. Presetting is then tailored to each machine, each taking approximately 15 minutes, and then five minutes to change the tool, the company says. The module knows the remaining life of a tool and signals when the prewarning stage has been reached. An order then can be initiated manually or automatically, early enough that the replacement tool is ready when the wear limit is reached. 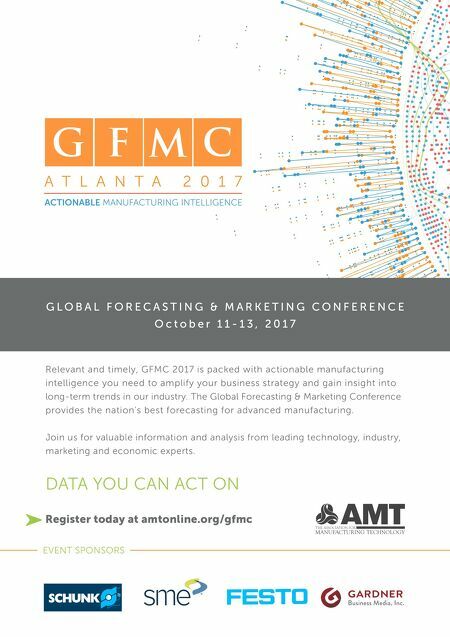 MPC identifies the individual tool when it is loaded, requests the data, and transfers the data to the machine control. This information remains available even after the tool is unloaded. T h e to o l c a n b e u s e d i n a n o t h e r m a c h i n e without recalibration. The home screen provides an overview of every machine connected to the MPC. Green, yellow and red coding identifies the tool status in the tool magazine. TDM Systems Inc., call 847-605-1269 or visit tdmsystems.com.